I know what you're thinking. Tacos. Pssh. Amateur work. I'll admit, these probably didn't make it into Julia Child's book, but then again, do any of us really have the luxury of spending the whole day in the kitchen? I know many individuals who celebrate "Taco Tuesday," but I personally get bored with soft tacos and/or the cheap-o Taco Bell taco shells I buy in bulk at WalMart. 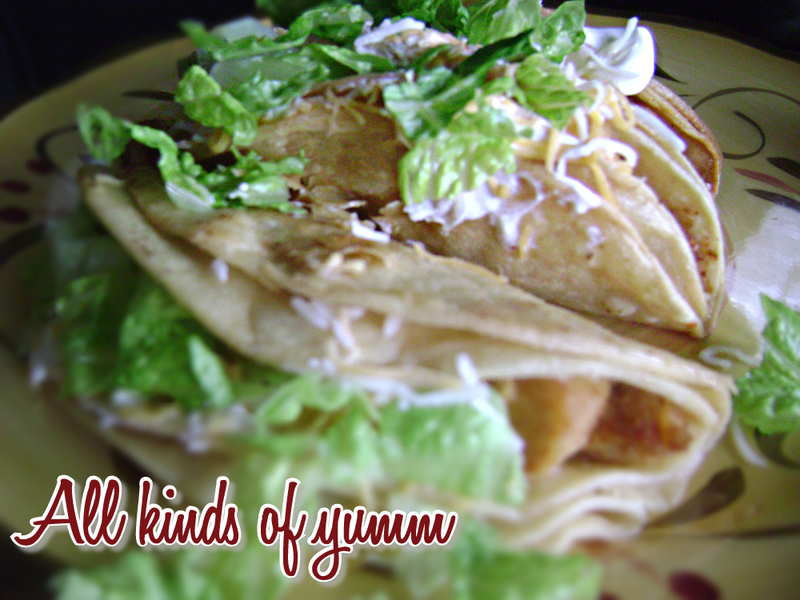 I made about 12-15 of these tacos, and even though it's not necessarily the most convenient way to do it, it adds some extra flare and is incredibly delicious. So delicious, in fact, that my health-obsessed hubby got out of bed at 12:30am and ate the two leftovers in the fridge that were for my lunch. Oh, the sacrifices we make. Chop up chicken breasts into small, bite-sized pieces. Throw in the pan with the heated oil. Add the can of green chilies. For the record, I do not like chilies, but you and any other picky eater in your home won't even notice they're there. They're diced so small that they'll blend right in, but they pack a lot of Mexican flavor. Sprinkle taco seasoning onto chicken while cooking. How much you put is up to you. Add 1 tablespoon of sour cream and combine. This makes the chicken mix nice 'n creamy. While the chicken is cooking, pour canola oil into large pan and turn the heat on high. This is another area where the amount of oil is up to you. I make it so that it was about 1 inch deep, but for those of you who don't sit in a cubicle all day, feel free to add more. Spoon 1 tablespoon of the fully cooked chicken mix into two corn tortillas. I double-up the tortillas because they can be very fragile and break easily. Only spoon 1 tablespoon of the chicken mixture into the taco shell, otherwise it'll spill over the sides. Practice safe deep-frying, people. Using tongs, place the chicken-filled tortilla into the hot oil. Using a fork or the tongs, hold it almost closed for about 15 seconds to keep that structure in the tortilla and to keep it from opening. After a few seconds, they'll stay by themselves. Let them sit on each side for about 2 minutes or until crispy and brown. Once you've done one, just keep 'em coming. You can do as many at a time as your pan can fit. Once both sides are done, remove tacos from hot oil with tongs, draining any additional oil back into the pan. When they are dry, gently open the taco just enough to add the shredded cheese, sour cream, taco sauce, lettuce and diced tomatoes. Be prepared to get your hands a little messy. But it's worth it. Warning: it's not the same without it. It's Friday night. Some of you will hit the bars. Some of you will hit the sheets. And some of you will do the right thing and make these crispy chicken tacos.